Do anything, but make it new. This served as a motto and framework for Mort Kamien as he helped develop the Kellogg School's world-class Managerial Economics and Decision Sciences Department (MEDS) in the early 1970s. A Purdue University-trained economist who had been a professor at Carnegie-Mellon since 1963, Kamien arrived at Northwestern in 1970, three years after Stanley Reiter, the person who recruited him. They distinguished themselves as intellectual leaders, imparting analytical rigor to business studies. They also attracted talented young faculty to the resource-constrained school. It was a strategy Kamien had seen his former employer apply. "Carnegie was a good place for young faculty," said Kamien, who nevertheless left the school when he felt pressured to divert his passion for technical economics into a more policy-oriented direction. "I didn't want to be pushed around." To Northwestern, he brought a desire to build an exemplary department. "I had some ideas about how a department should be run," he says. "You get bright young people, put them together and let them do whatever they wanted, as long as it was first rate." Rather than hiring by discipline, Kamien, MEDS chairman from 1971-1975, went after the best people, regardless of their field. "We knew smarts," he says. In many cases, these turned out to be game theorists who, after surviving Kamien and Co.'s grueling interviews designed to weed out the "dancing bears" from the stars, were hired and encouraged to pursue research without departmental interference. "They didn't have to do the work that I did," said Kamien, whose own interests drew him to microeconomics, industrial organization, entrepreneurship and dynamic optimization. 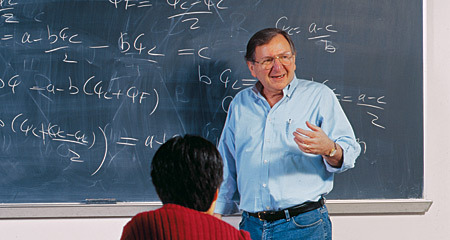 Among his many publications are contributions that helped found the modern theory of limit pricing under uncertainty. Other work was instrumental in developing the theory of patent races — how firms compete to develop a new product or production method. He has also produced two classic textbooks, co-authored with Kellogg peer Nancy L. Schwartz. A fellow of the Econometric Society, Kamien served as the Kellogg School's associate dean for academic affairs three times, each a two-year stint. In addition, the Joseph and Carole Levy Distinguished Professor of Entrepreneurship has been director of the school's Heizer Center for Entrepreneurial Studies for nearly 20 years. Despite the seriousness with which he approaches his work — "People have this impression that I'm very hard. I don't try to be," he says — Kamien also displays wit and exceptional humor. These can appear during a conversation that ranges from Mary Shelley's Frankenstein to Einstein's theories to Woody Allen's films. It might also show up in a discourse on the real message behind The Wizard of Oz, a text Kamien says can be interpreted as a late 19th century populist allegory, with symbolism that argues against the U.S. gold standard, then part of an economic milieu creating hardships for American farmers and laborers. For all Kamien's academic achievements, he remains down-to-earth — a vestige, perhaps, of his undergraduate days at City College of New York. "It wasn't a prestigious place, but the students were very, very smart," recalls Kamien. "The tuition for the whole year was $10 — your gym fee." This foundation also seems to have framed Kamien's research tastes, which guard against privileging the abstract simply because it's abstract. Some scholars pride themselves on doing work that "only five people in the world understand," he says. "This supposedly shows how brilliant they are," but that kind of research "may not be particularly useful or interesting." As he retires this year, Kamien can reflect on a legacy that includes his contributions to MEDS, a department he says is especially strong in analytical political science, an area where pioneering opportunities remain to be discovered.